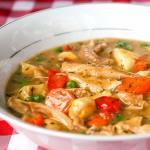 Leftover Turkey Stew - made by roasting vegetables to bring out their natural sweetness and flavour and using leftover turkey from a special occasion dinner. Toss the carrot, parsnip and celeriac in 3 tbsp olive oil. Season the vegetables with salt and pepper and roast on a cookie sheet for about 30-40 minutes tossing occasionally until the vegetables are fork tender. I like to roast them on parchment paper so they are certain to to stick to the pan. In a large dutch oven, cook the onions and garlic in a little olive oil over medium heat until softened. Add the turkey stock, savoury and sage to the pot and bring it to a rolling boil. Thicken the stock to make gravy by whisking in the flour and water mixture. You may not need to use all the flour and water mixture but the gravy should be relatively thick. Stir in the roasted vegetables, peppers, peas and turkey. Cook in a 350 degree F oven for an additional half hour. Serve with dumplings if desired. If making the dumplings, add them in the last 15-20 minutes the stew is cooking with the lid on the dutch oven.